Fr. Matthew Carnes, S.J., has one word of advice for anyone trying to understand the Jesuit values upon which Georgetown University is built. Not that he would actually do this, but sometimes, Carnes, a much-honored Georgetown political science professor and Jesuit priest, feels like shouting out that simple instruction: to harried undergraduates rushing across Healy Lawn; to busy professionals racing up and down the stairs of the School of Continuing Studies (SCS) after a long day of work; to all those who find themselves exhausted from chasing after … something, even though they may not know quite what it is. 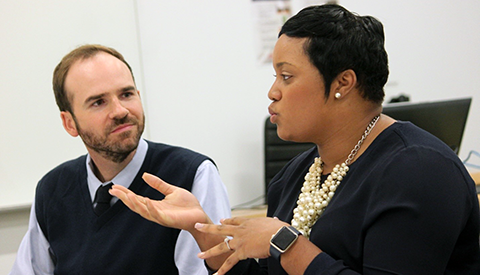 Jamie Kralovec, instructor for “Jesuit Values in Professional Practice,” listens to student Rashida Jenkins. “Jesuit Values in Professional Practice” was created by Jamie Kralovec, Program Director for the master’s in Urban & Regional Planning program, and is open to all SCS students. One of the reasons that Kralovec came to Georgetown, after working with the White House Council on Strong Cities, Strong Communities, was because of its Jesuit mission and values. 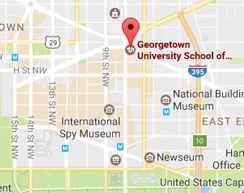 Founded in 1789, Georgetown is the oldest Catholic and Jesuit university in the United States. That much is probably well known to most anyone associated with the institution. Students and faculty know Georgetown’s history and can recite at least some of its Jesuit tenants, such as “Cura Personalis” (“Care of the Person”) and “Women and Men for Others.” But just how Jesuit values inform the educational programs might not be as universally understood, particularly at SCS, which is located in downtown Washington, D.C, several miles from the main campus, and serves mostly busy professionals with full lives outside of school. In many ways, it is especially fitting that a professional studies school like SCS would embrace the University’s Jesuit values. 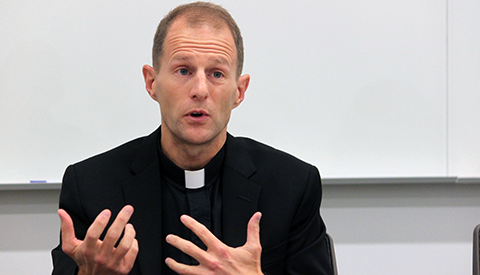 In his book, The Jesuit Guide to (Almost) Everything, James Martin, S.J., says Jesuits emphasize that God can be found in all things, that there is no artificial division between the spiritual and the material. Therefore, Jesuits are adamantly “of the world”; they are “contemplative in action” and believe that any pursuit—especially one as personal as a vocation—can provide an avenue to God. In keeping with Georgetown’s tradition of “Educating the Whole Person,” the Jesuit values course is both academic and personal. Students learn about the life of St. Ignatius Loyola, who founded the order some 450 years ago. They read extensively about the Jesuits’ history, their mission and spiritual practices, and their approach to education. They explore Georgetown’s distinctive mission and values, which, in addition to those already noted, include: “Ad Majorem Dei Gloriam” (For the Greater Glory of God), Academic Excellence, Faith and Justice, Interreligious Understanding, and Community in Diversity. Students also have the opportunity to hear directly from presenters from within and outside the University, like the Jesuit Refugee Service and Georgetown’s Kalmanovitz Initiative for Labor and the Working Poor, who are applying Jesuit values in practice. On the personal side, class members share insights about their own lives and faith journeys, and participate in class exercises that show how the Jesuits’ distinctive mix of the spiritual and the practical is as relevant today was it was in the 16th century. Class member Christine Senteno is a student in the Bachelor of Arts in Liberal Studies program and, in her day job, a Senior Communications Coordinator for the Service Employees International Union (SEIU). She said she first didn’t see much connection between her work organizing political campaigns and the Catholic faith in which she was raised. But then she thought about the Jesuits’ emphasis on discovering one’s talents, embracing them, and then using those gifts for the greater good. If her talent was in lobbying for more funds for public schools or helping to organize an SEIU campaign to raise the minimum wage—well, maybe there was a connection after all. One of the course’s main goals is to deepen awareness of the Jesuit commitment to social justice—both individual acts of charity and community service as well as broader social action to combat structural injustices like homelessness, environmental degradation, and the global refugee crisis. Georgetown’s Center for Social Justice designated the course as “community-based learning” given that each student also takes on 20 to 40 hours of regular work over the course of the semester at a community-based organization and reflects on that experience in class. Kralovec invited Capital Area Immigrants’ Rights Coalition, Central Union Mission, and Father McKenna Center to partner in this inaugural class to provide opportunities for students to meet community-defined needs.